My son had to do a slide presentation on Romania as part of his homework. While helping him with this project, I read a little about the revolution of 1989 that led to the overthrow of Nicolae Ceausescu. I didn’t know that the revolution was started by a group of Christians who were protesting the arrest of their pastor by the “Securitate,” (the Romanian secret police organization). Ceausescu’s regime, impressed by Juche ideology after visiting North Korea in 1971 , began a program of “Systematization.” Apparently, Kim Il-sung believed in national “self-reliance” characterized by the idea that “MAN IS THE MASTER OF EVERYTHING AND DECIDES EVERYTHING.” This communist/atheist/nationalist ideology rejected God. In Ceausescu’s Romania, it led to the destruction of villages with a population of under 1000 people. Involved in this plan was the destruction of many churches. As a result, Pastor Laslo Tokes became a critic of Ceausescu and his program of Systematization. In 1981, he wrote an article on Romanian human rights abuses for the journal Counterpoints. This caused the Securitate to take notice of him and begin their harassment. Tokes gave sermons against Systematization and organized other pastors to oppose it. His rebellion led to the Securitate demand that he move to a more isolated parish. It was the parishioners of Tokes’ church, surrounding his flat and refusing to allow him to be relocated, that started the 1989 Revolution that overthrew Ceausescu. 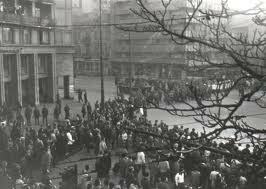 As the parishioners refused to give up, and hundreds formed a human chain around Pastor Tokes’ building, college students joined with them, singing hymns and songs such as “Wake Up, O, Romanian!” They marched to the communist party headquarters and shouted “Down with Ceausescu!” and “Down with communism!” A confrontation ensued, shots were fired, rocks were thrown, and water canons blasted the crowds, but the crowd continued, even dismantling the water canons and throwing them in the river. In the next days, industrial workers would join the crowd by the thousands. The insurrection was complete. Ceausescu fled. Eventually, Nicolae and his wife would be tried and executed. The world would then see the horrors of the Romanian orphan system, leading missionaries and relief organizations from around the world to rush to rescue the little ones who were abandoned and neglected. As a result of the revolution, Romania became a constitutional republic. It now has an elected president (rather than a dictator), a bicameral parliament, and a supreme court. In 2007, it became a member of the European Union. Laslo Tokes would take the the place of the communist bishop of the church, leading Romania during a time of upheaval into true spiritual and societal renewal. He was also elected in 2007 to a seat in the European parliament. As usual, it would take the heroism of persecuted Christians to overcome the tyranny and evil caused by those who reject the scriptures and God by pursuing thier own form of Eden on earth.